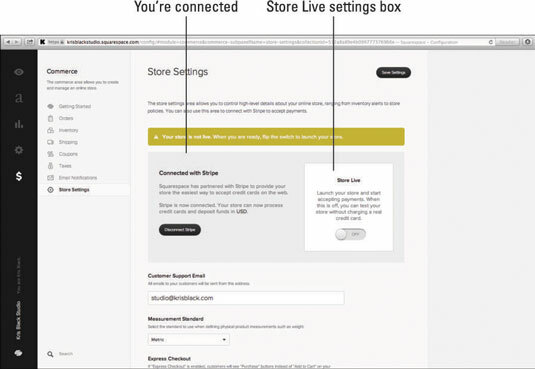 The first thing you’ll notice when you go to Site Manager→Commerce→Store Settings is the big yellow box at the top of the screen indicating that your store is not live. Before you can make your store live, you must connect your store to Stripe, the payment processing service used to accept payments on your site. Click the Connect Stripe button. 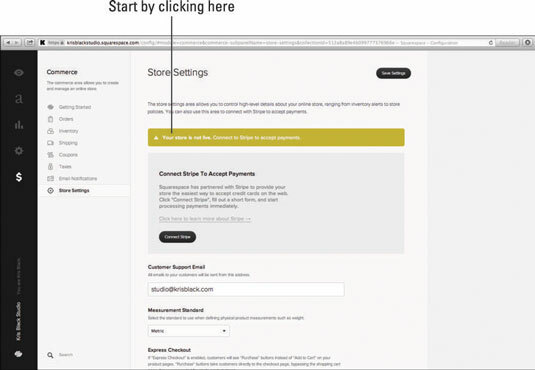 A pop-up window appears, displaying the Stripe sign-up form. If you don’t have a Stripe account, complete the sign-up form. If you do have a Stripe account, log in to your account by clicking the login link at the top of the pop-up window. After you are logged in to Stripe, the pop-up window will close and your Store Settings window will refresh. The Connect to Stripe box will now say Connected to Stripe, and you’ll see a Store Live settings box. If you already have a Stripe account and are logged in, clicking the Connect Stripe button will instantly connect your site to Stripe without having to log in again. If you have more than one Squarespace site that will be using Commerce, you’ll need a separate Stripe account for each site. If your store is ready to go live, you can click the switch in the Store Live box to start accepting orders and processing real payments. Otherwise, leaving this switch off will allow you to process fake payments to credit cards to test your store. Customer Support Email: Enter the e-mail address that you want to appear on all e-mails sent to your customers. Measurement Standard: Select between Imperial (pounds) or Metric (kilograms) standards for calculating measurements such as the weight of products and weight-based shipping charges. Express Checkout: Select this option if you want customers to skip the shopping cart and go directly to a checkout page. The Add to Cart button will change to a Purchase button. If your store sells a single item, you should select this option. Shopping Cart Style: Select this option if your site has a dark color scheme; this will apply a light color scheme for the shopping cart. Newsletter: Select this option to connect to your MailChimp account. You can select a mailing list you’ve set up to appear as an option during checkout, so that customers have an opportunity to join your mailing list. Automatic Stock Level Alert Email: Move the slider to indicate what stock level will trigger a restocking e-mail notification. You can select to never be notified or a number from 1@@20. Although a web search may yield boilerplate or template store policies that you can customize, I recommend consulting a lawyer with experience helping people establish their online businesses. After adjusting any of these settings, make sure to click the Save Settings button at the top of the page to save your changes. The next area of Commerce we’ll review is the Orders area.